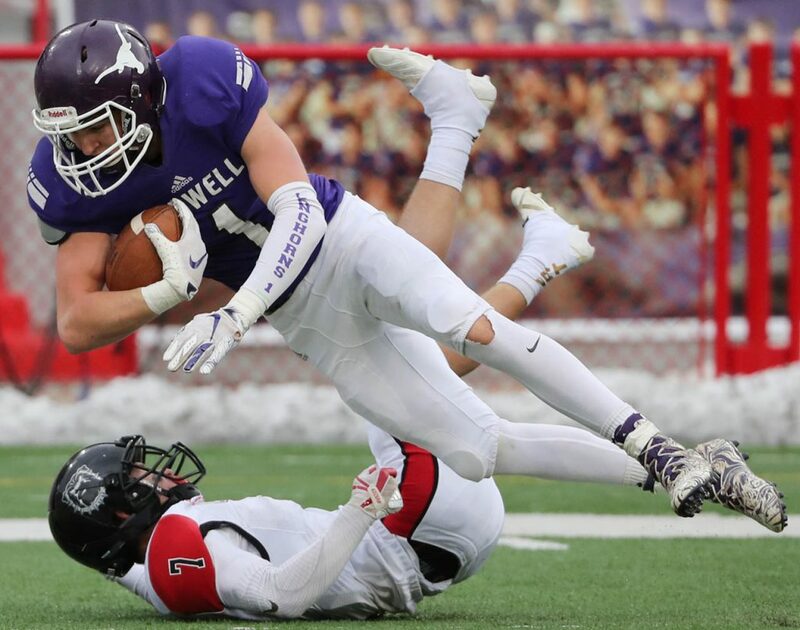 Burwell senior wide receiver Joshua Urbanovsky falls over Creighton junior defensive back Thad Hazen during the Class D1 Nebraska State High School Football Championship at Memorial Stadium in Lincoln Monday. Creighton won 32-30. 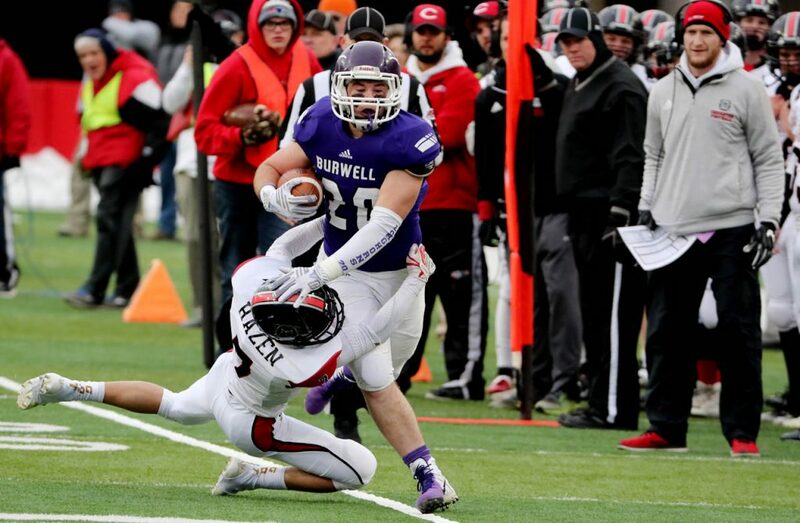 Burwell junior running back Jase Williams (on his back) signifies a touchdown upon scoring against Creighton as does his teammate Corey Dawe (10) during the Class D1 Nebraska State High School Football Championship game at Memorial Stadium in Lincoln Tuesday. 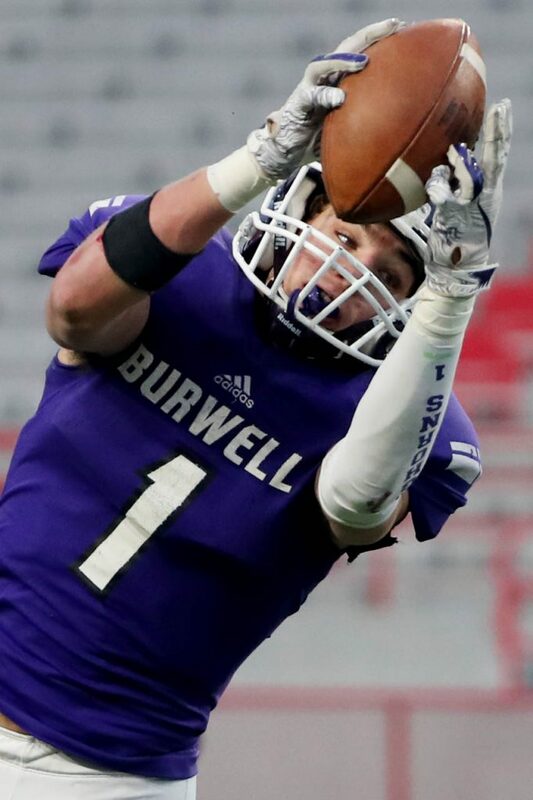 Burwells Joshua Urbanovsky senior extends to catch a pass against Creighton during the Class D1 Nebraska State High School Football Championship at Memorial Stadium in Lincoln Monday. Creighton won 32-30. 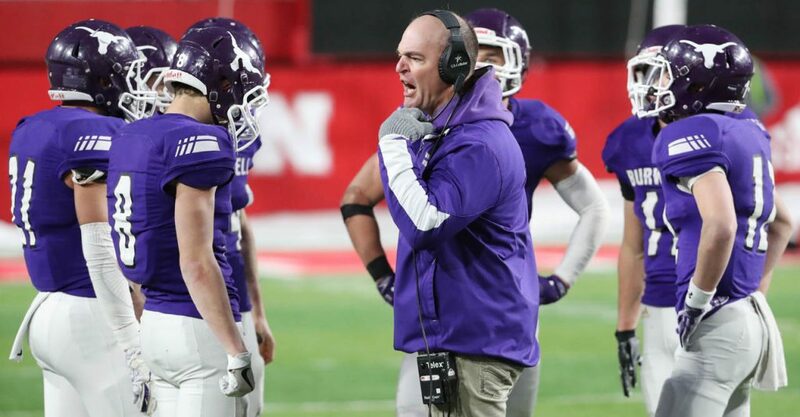 Burwell head coach Luke Gideon calls his players together during a timeout against Creighton at the Class D1 Nebraska State High School Football Championship at Memorial Stadium in Lincoln Monday. Creighton won 32-30. Burwell senior linebacker Colby Mitchell, left, is stiff armed by Creighton senior running back Bryce Zimmerer during the Class D1 Nebraska State High School Football Championship at Memorial Stadium in Lincoln Monday. Creighton won 32-30. 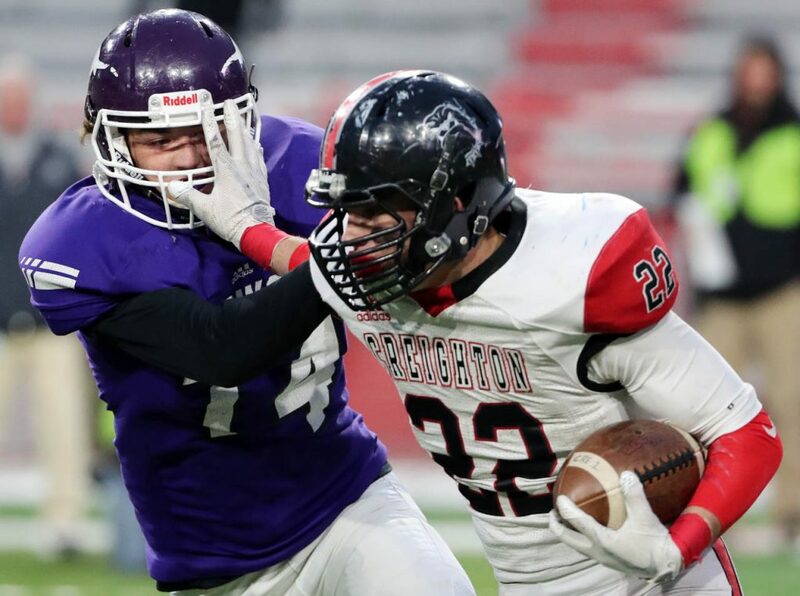 Burwell junior running back Jase Williams is forced out of bounds by Creighton junior defensive back Thad Hazen during the Class D1 Nebraska State High School Football Championship at Memorial Stadium in Lincoln Monday. Creighton won 32-30. 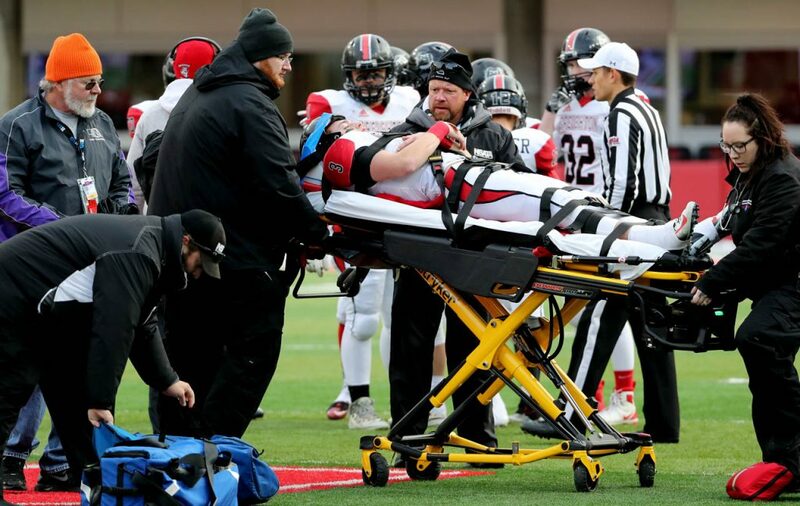 Creighton junior starting quarterback Brayden Zimmerer is taken off the field on a gurney during the Class D1 Nebraska State High School Football Championship against Burwell at Memorial Stadium in Lincoln Monday. Creighton won 32-30. 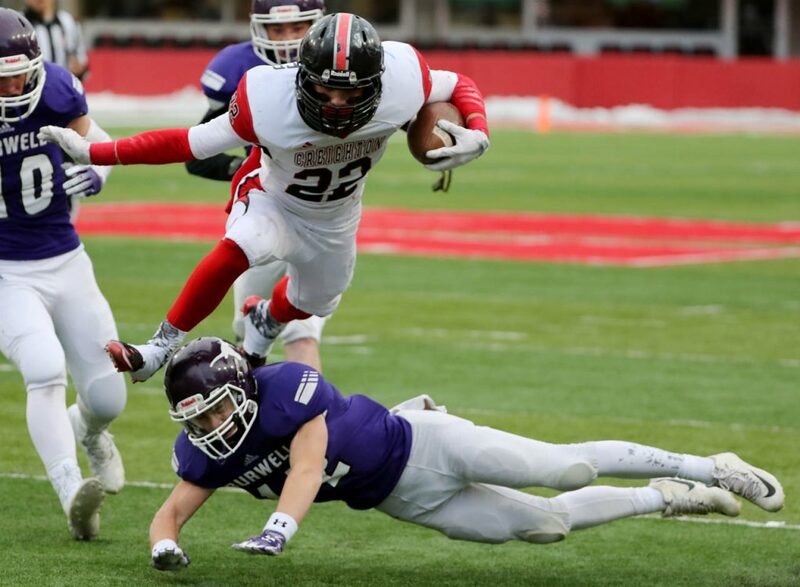 Creighton senior running back Bryce Zimmerer jumps over Burwell senior Coy Gideon during the Class D1 Nebraska State High School Football Championship at Memorial Stadium in Lincoln Monday. Creighton won 32-30. 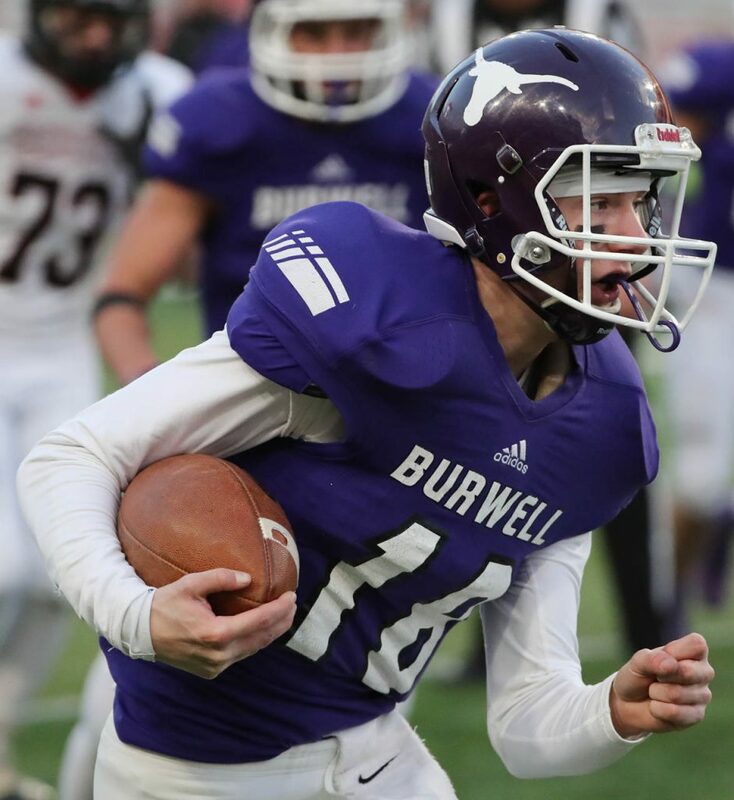 Burwell senior quarterback Sage Konicek runs up field against Creighton during the Class D1 Nebraska State High School Football Championship at Memorial Stadium in Lincoln Monday. Creighton won 32-30. 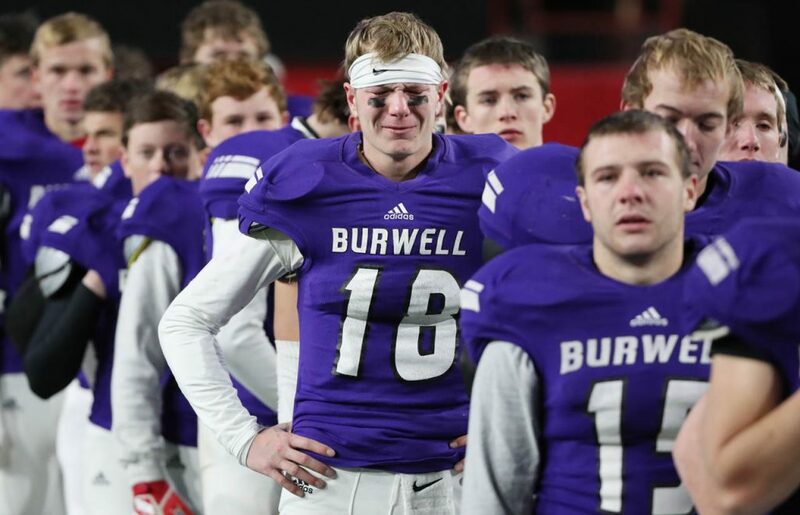 Burwell senior quarterback Sage Konicek (18) becomes emotional as Longhorn players stand in line to receive their second place medals during the Class D1 Nebraska State High School Football Championship at Memorial Stadium in Lincoln Monday. Creighton won 32-30.